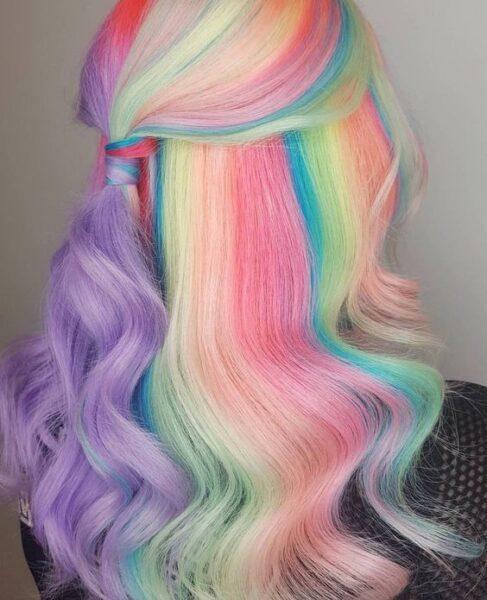 Rainbow Hair: the Craziest Experiments | KSISTYLE! 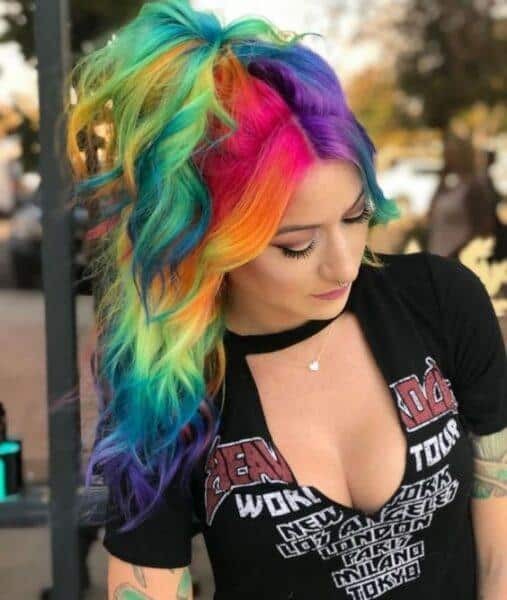 No matter how hard our mothers and grandmothers protest, modern young beauties will check if colorful hair suits them. It all started with blue and pink strands which looked rather modest. Eventually, the dyed area increased, the colors became more and more bright. 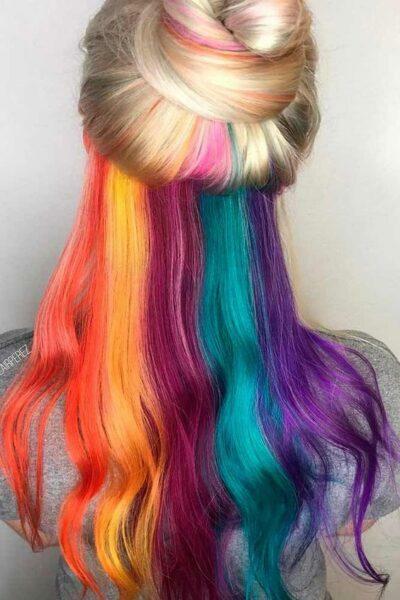 And now rainbow hair is a new trend. To those who can’t decide what color to choose, the stylists suggest just to use all of them. 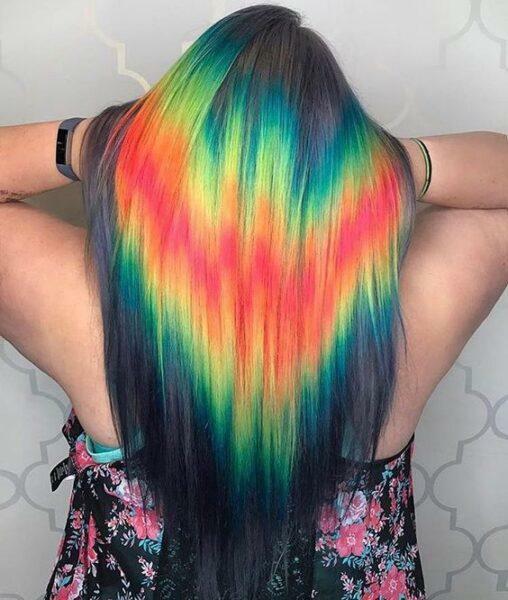 What is rainbow hair? 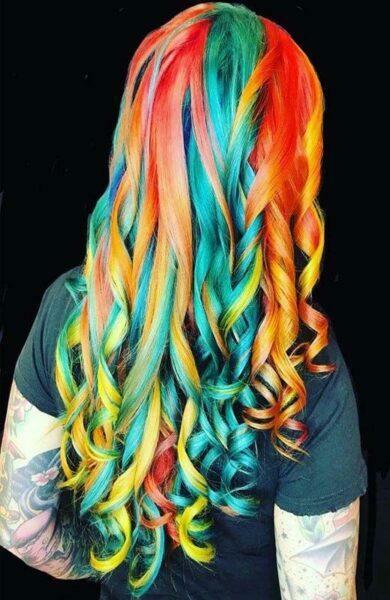 This is hair dyed in 5-8 different bright colors, imitating the rainbow. Bold, isn’t it? Yes! 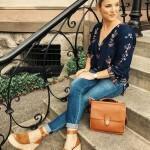 Bold, beautiful, original and bright! 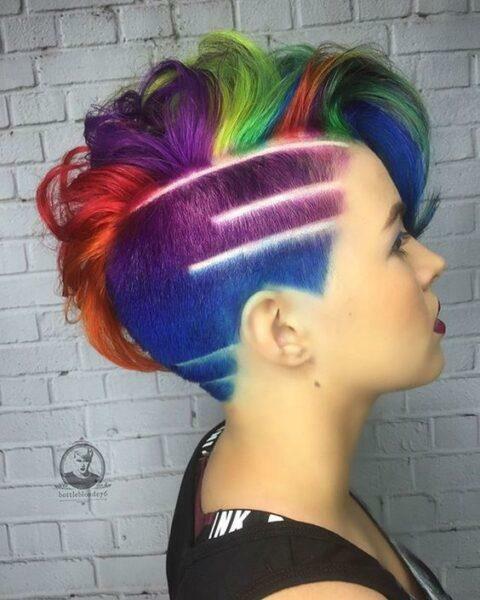 Our authors followed attentively the trends of dyeing hair in unusual colors. 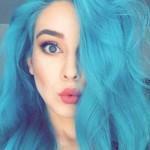 The experts published their valuable advice about how to color your hair in blue color beautifully. Then we collected an fascinating gallery of photos of girls with lavender hair. And, finally, we suggested to the most courageous experimenters how to choose one of 10 shades of pink hair, which is the most suitable for their skin tone. 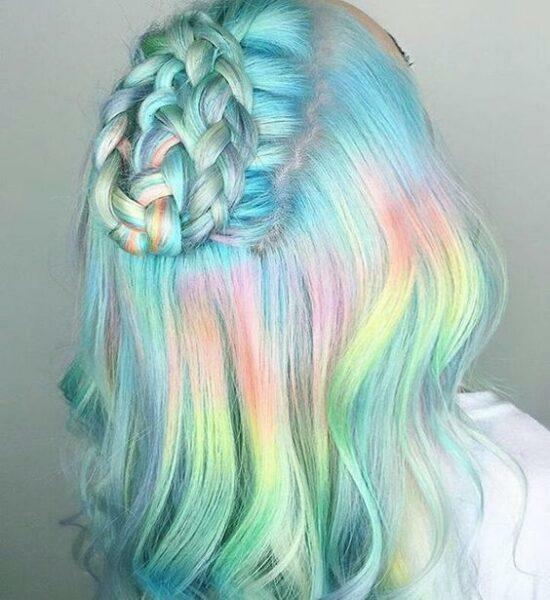 And today you will see the original forms of creating multi-colored locks, an unusual rainbow in your hair. Enjoy! 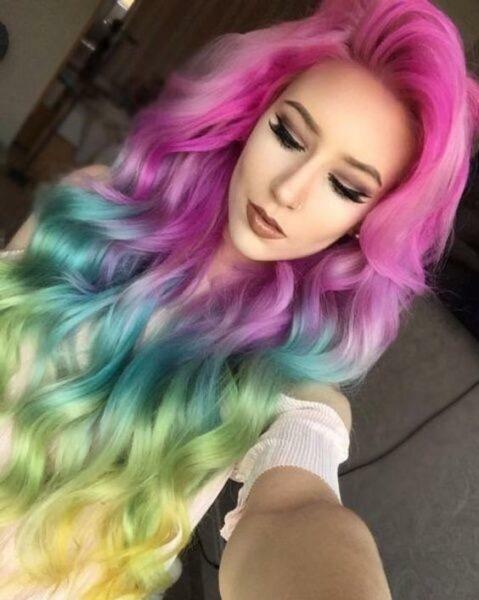 The whole area of the hair is divided in 4 parts and every part is dyed in different colors. If some strands are lifted to comb your hair, there will be an interesting combination: the colors weave and mix with each other. 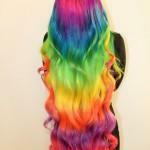 It’s not very difficult to make such a rainbow. Even a novice hairdresser can cope with this task. Are you hesitating? 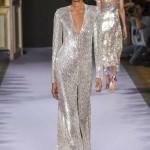 You want to change your hair color now radically but the next day you worry about looking too bold? How will your boss, colleagues and relatives react? 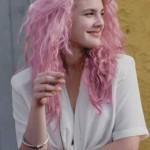 What will happen if after a week you will become bored of being a rainbow-haired girl? 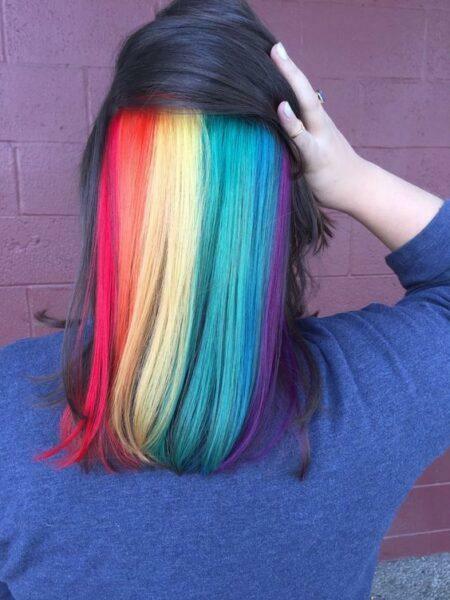 The best variant for you is a rainbow under the top layer of your hair. The hidden rainbow will be visible only if you want to. However, the top layer of your hair will remain the usual light, sometimes dark shade. 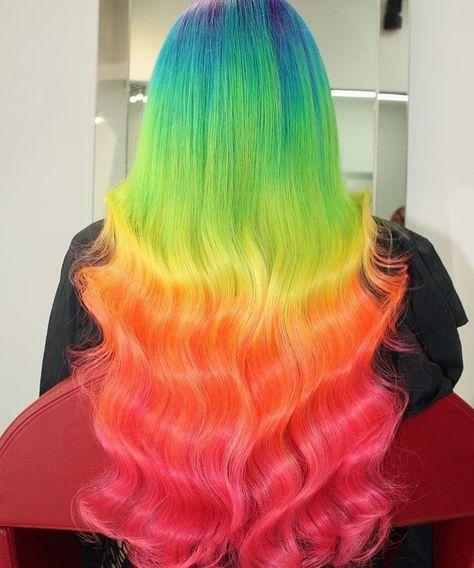 Rainbow hair inside will be visible only if you lift the unpainted top and release the colorful madness. This variation is performed in a similar technique. In the process of dyeing, the upper layer of hair is lifted, fixed with a clip. A thin layer on the back of the head is dyed in a chosen color. Then another layer is separated in the same way and colored with another bright shade. The number of color layers may be different. 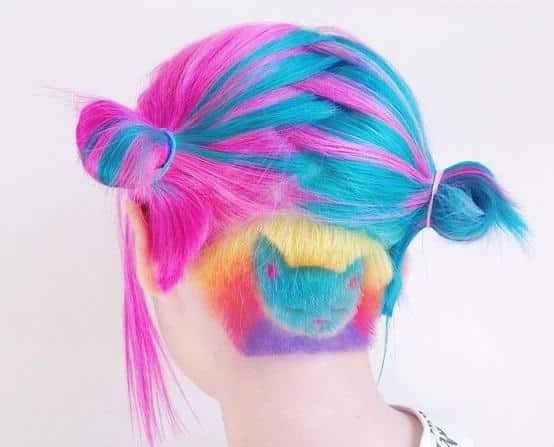 Thus, the loose falling hair has one color, and in the hairstyle there will be a multi-colored madness. The more radical solution combines a bright palette of shades and relief patterns or just ornaments. The favorite theme of rebel-dreamers is cats on the back of the head. Moreover, there are spider lines, longitudinal lines, zigzags, etc. 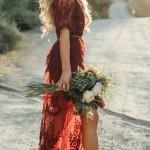 One more bold interpretation is long and colorful strands. 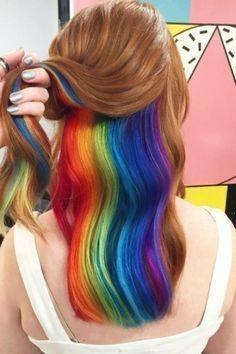 You can dye your hair in bright colors from the roots to the ends, as it’s on the photo. 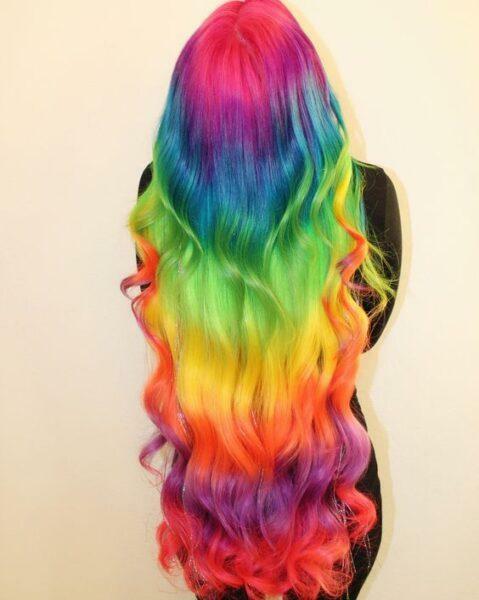 Vertical rainbow looks perfectly on the long colorful hair, especially on curly. 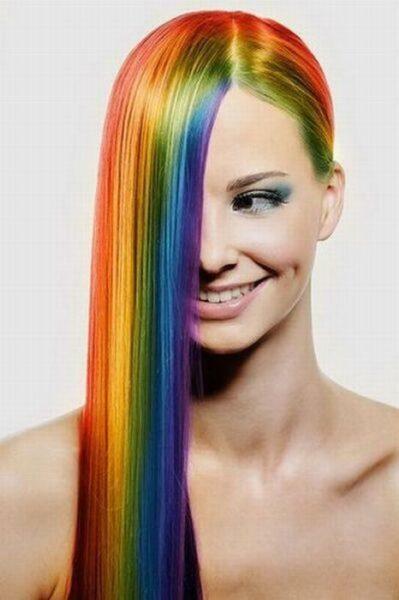 Girls who want only to try on the rainbow can start with dyeing only some locks not form the roots. 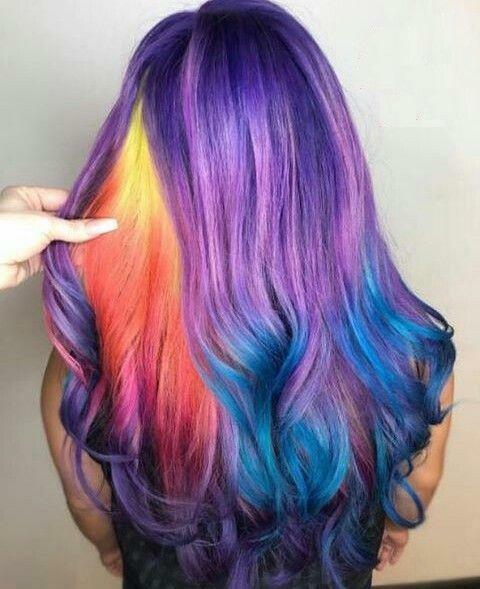 This can be performed in an ombre technique. It’s a smooth transition of colors. This is a perfect variant for young girls, students and teachers. 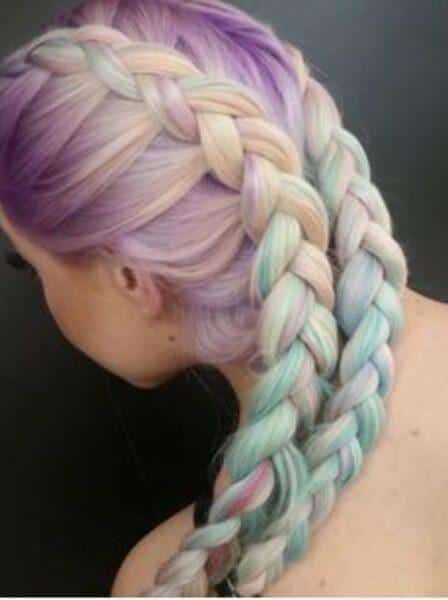 Hairstyle in pastel rainbow colors looks very cute and gentle, it emphasizes the youth of the girl. 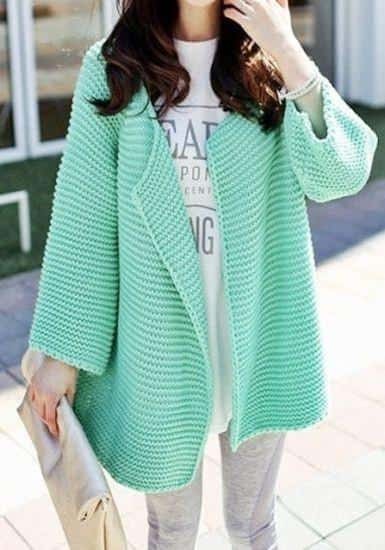 This color doesn’t offend the eyes of the people around, it looks beautifully in a braid, in a clump, and on flowing hair. Most often, experts advise their clients to use the blue-violet gamut as a basis. It’s very difficult to create colorful highlights. Only a professional hairdresser can handle this. But this hairstyle looks gorgeous, original and unusual. Short strokes of different colors are applied with a thin brush and thus the hairdresser has to be careful and accurate. It’s one more original form. 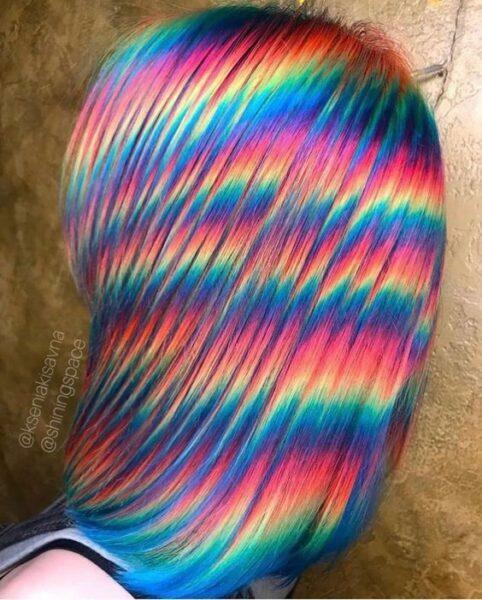 Only the top of the head is dyed in bright colors. 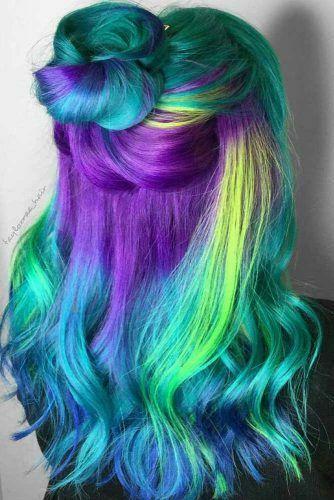 Look how beautifully ombre looks on the top of the head! If the bright «hat» is created by a professional, it can look originally and brightly even when the hair start to grow. 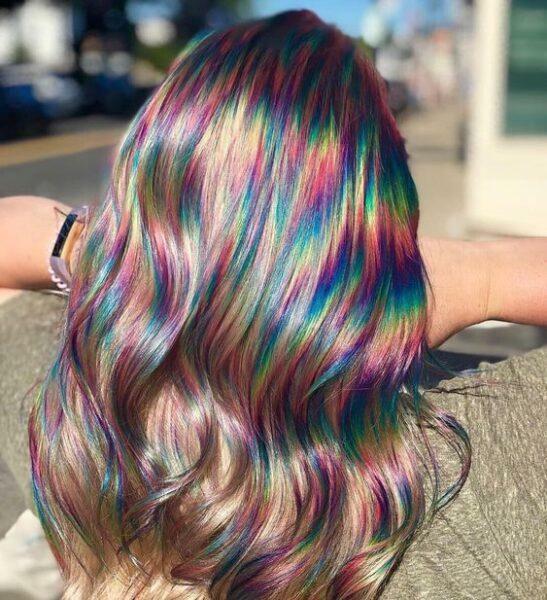 How do you like a colorful hologram on your hair? 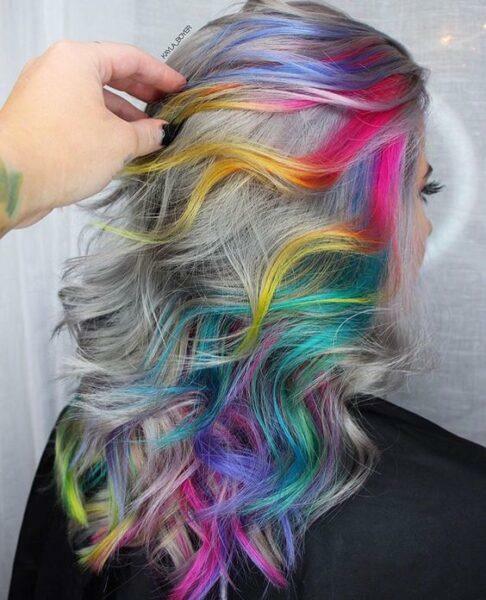 A slight rainbow hair 3D effect is in line with the latest fashion trends. 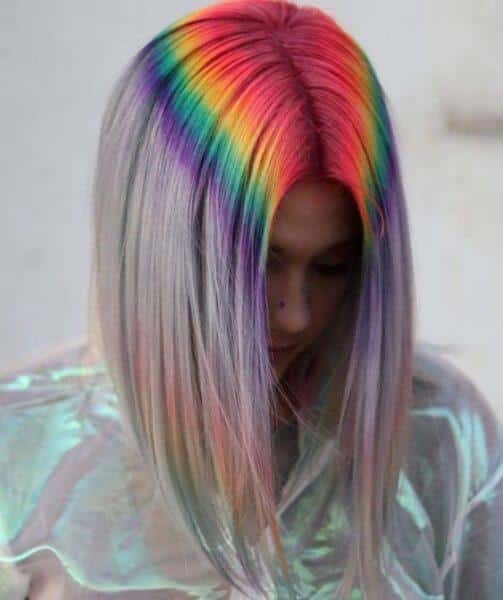 Unusually colored throughout the length in the technique of rainbow ombre, your hair will definitely surprise all friends and acquaintances. If you like the stylish variations, collected by our authors, then save these extremely beautiful and bold ideas to your networks just with the touch of the button. 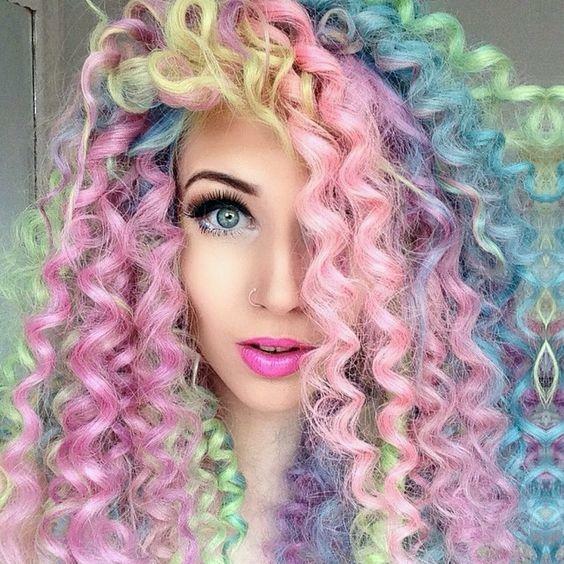 See more interesting options for how to dye your hair in unusual star colors: Avril Lavigne, Rihanna, Nicole Richie, Gwen Stefani and many others.